The Digital Metrics Field Guide is the definitive reference for brands of any size that advertise, market or engage with their customers and prospects through email, the Web, mobile or social. It is available for pre-order from Amazon, Barnes & Noble, and independent booksellers in the US and around the world. Every brand gets performance reports through their providers, which furnish a stunning array of metrics on just about anything that happens on or through the platforms they measure. Yet many brands are unsure about their measurement and want to become more confident. They want to know what metrics are available, what is known about them, how to select them, and how to analyze and report them in ways that help them understand the impact of their digital initiatives. 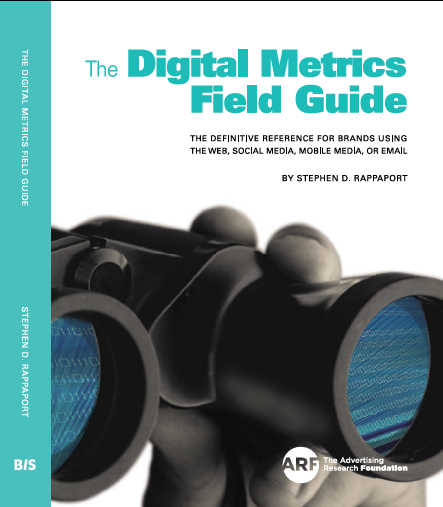 The Digital Metrics Field Guide: The Definitive Reference for Brands using the Web, Social Media, Mobile Media, or Email, written by Stephen D. Rappaport , with the support of the Advertising Research Foundation, and published by BIS Publishers does just that. This unique, comprehensive resource was intended for those of us who use metrics and need straightforward, authoritative, non-technical guidance. Field Notes, labeled as “ARF Comments,” review relevant research about a metric. Notes typically summarize 2-5 studies and explain the strengths, limitations and issues surrounding each metric. The research sometimes challenges or debunks the conventional wisdom around a metric, which helps readers avoid unproductive strategies and costly mistakes. All research is properly cited with links provided. Category: locate metrics related to interest areas such as: audience/traffic, advertising effectiveness; engagement; amplification/endorsement or e-commerce. Marketing Stage: the Field Guide utilizes a nurturing model that is appropriate to digital-Capture, Connect, Close and Keep, and assigns metrics to each. Web, social, mobile or email: Metrics are assigned to one or more of these channels. The emergence of humetrics: Because digital measurement captures what people are saying, doing and feeling, metrics become a way to understand people as people living their lives. Measures are no longer impersonal counts or percentages, but insights into human beings. Trends and directions in measurement: Twelve experts contributed essays on measurement today and how to take it forward in the humetrics era. 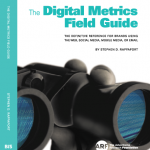 Pre-order your copy of The Digital Metrics Field Guide today from Amazon, Barnes & Noble, and independent booksellers in the US and around the world. Stephen is a sought after keynote speaker, panel moderator, business school lecturer, and workshop leader for such organizations and brands as: the Advertising Research Foundation Conferences, World Federation of Advertisers, Japan Advertising Association, Canadian Marketing Association, Marketing Accounting Standards Board, Institute for Public Relations; Travel and Tourism Research Association, American Association of Wine Economists, The Wharton School, Columbia Business School, New York University, Johnson & Johnson, Capital One, Ford Motor Company and many other brands. Click here to contact Stephen regarding your talk or workshop. Just started working on the 7 December Sunday Times puzzle, 81 across reads “Standard of measurement.” Six letters. Third letter “t.” Hmm… The answer brought a smile. New cover! That’s the image to the left. I like the way BIS Publishers modified the color scheme, giving it a lighter, brighter feeling, and coordinating the colors with the design inside. PREORDER NOW from Amazon, Barnes & Noble, and Independent Booksellers in the US and around the world.